I went a little crazy with red, black and white this week! In celebration of my daughter's high school graduation, we hosted a luncheon for her closest friends. Of course, we decorated with the school colors and the school mascot, which happens to be the very cute scottie dog! I love it!!! It's so cute. Actually, my hometown high school's colors are red and white, too, with black as an accent color. We are the Eagles. Congratulations to your daughter! What a good momma you are to do this for her! Have a great weekend. GORGEOUS!!! 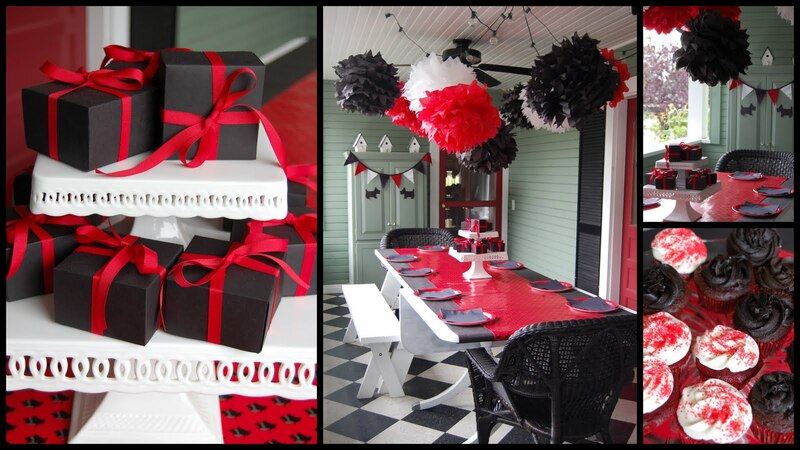 I love all the red/black details and especially the tissue paper embellishments. How cool that their school mascot is a scottie dog. Have a wonderful summer. I hope it's relaxing. Fantastic!!! You did an awesome job Heather!!! I bet your daughter loved it. Wow! You did such a fantastic job! Looks like a magazine. Congrats to your daughter! Beautiful celebration! What a wonderful end to her high school experience! Awesome decor! I love what you came up with. Job well done. Such wonderful decorations...I love the colors and the pom-poms are marvelous! All so very, very cute. You are so cleaver. That is probably the coolest mascot I have ever seen! Love the fabric bunting and dogs on the cabinet. It all looks so festive. Great job! What a gorgeous job you did on the party! Everything was beautiful. What a cute mascot! Congrats to your daughter, now she's on to her next big adventure! P.S Check out G&G's web site, www.gardenandgun.com I think you will like it! Besides being able ot subscribe, it's got lots of articles, receipes etc. Welcome back to blogging...I've been away from reading blogs too! Congratulations to your daughter. Such a wonderful accomplishment. The party is just beautiful. We had a graduation last year and another one the year before that, so I know how crazy it can get. Enjoy every second. Yay! Red and Black were my school colors too. Everything looked awesome. Congratulations to the graduate. Hi Heather! What a fun mom you are to throw such a stylish graduation event! You have the perfect porch for entertaining! I don't think Martha Stewart herself could have put together a nicer party setting! What a fabulous party! You seriously couldn't ask for better school colors and mascot. :-) You did such a great job and I'm sure you are considered the coolest mom around! 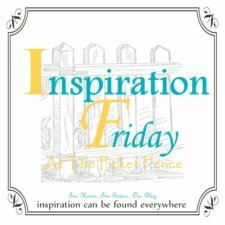 Thanks so much for sharing this at Inspiration Friday Heather!